Chaos: When this card is flipped, move one of your characters. When you move this card to a Problem, you may exhaust it to frighten another Friend there. There's a number of reasons that "take the bull by the horns" is a phrase and "take the buffalo by the horns" isn't. 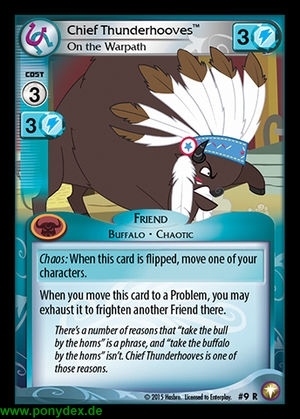 Chief Thunderhooves is one of those reasons.